TvN's drama "What's wrong with Secretary Kim?" has broadcast its finale episode last July 26, 2018. 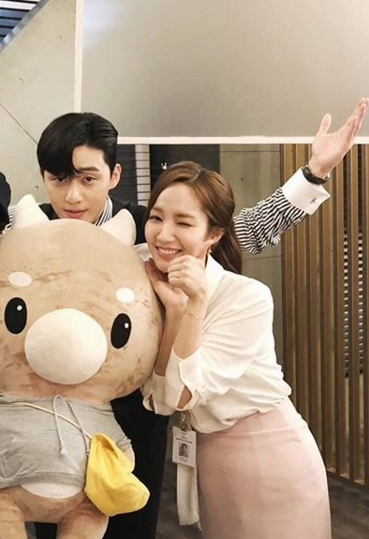 It captures the heart of many people because of the outstanding chemistry seen between the two lead characters Park SeoJoon, playing as Lee Young-Joon, the Vice Chairmain of a major corporation where as Park MinYoung, playing as the secretary named Kim Mi-so. Early morning of July 27, the Dating rumors between the two has broke out through different media outlets, based on a leaked Sports DongA newspaper which supposed to run later today saying that Park SeoJoon and Park MinYoung has been dating already for three years since before they accepted to be part of the said drama "What's wrong with Secretary Kim?" and keeping it low among public and colleagues so they won't affect any productions they were in as they are focusing more both on each other's career. As the rumors of two actors begun, the netizens start digging up each other SNS and started to make a "Lovestagram" stating or proofs that the two are travelling together abroad and was seen wearing couple items. Some netizens felt happy upon the dating rumors and started "congratulating Park SeoJoon and Park MinYoung" while saying that "their guess wasn't wrong, as every scenes in the drama felt so real" while others cannot believe and says will just wait for the confirmations and etc. Park SeoJoon's agency, Awesome ENT. says, "Park Seo Joon and Park Min Young are simply co-workers. Their dating reports are not true. It seems their chemistry in the drama sparked up all the interest." Meanwhile, Park MinYoung's agency, Namoo Actors also replied, "The two only became close through their recent drama; their dating reports are untrue." Hence, the dating rumors isn't true and its just that Park MinYoung and Park SeoJoon looks really great both on screen that everyone wishes for them to continue dating in real life.